Jeff Goldblum has cornered the market on any film that calls for a hip genius. With his debut role in Robert Altman's 1974 film California Split, Goldblum then appeared in Altman's next film Nashville. The latter role jump-started Goldblum's career, leading to roles in Woody Allen's Annie Hall, and 1978's Invasion of the Body Snatchers. By the late-80's, Goldblum had staked his territory with turns in The Fly. 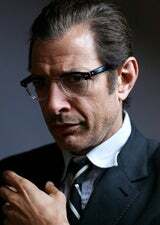 He then played Ian Malcolm in the Jurassic Park movies and starred in 1996's Independence Day.